(Nanowerk News) A novel micro-reactor approach for fabricating self-organized, photosensitive gold-peapodded silica nanowires has been developed by a group of researchers in Taiwan. Li-Chyong Chen from the Center for Condensed Matter Sciences at National Taiwan University in Taipei told Nanowerk that "these results manifest the potential of using Au-silica nanopeapods as color-selective optical sensor or nano-switches." "Our micro-reactor approach can be applied to prepare a range of hybrid metal-dielectric 0D-1D nanostructures that can be used as functional building blocks for nanoscale sensors, waveguiding devices, and other optoelectronics" says Chen, adding that in the near future, they also plan to replace the noble metals by magnetic metals. The work with the title "Photosensitive gold-nanoparticle-embedded dielectric nanowires" was published in the Feb. 2006 edition of Nature Materials. Noble-metal nanoparticles embedded in dielectric matrices are considered to have practical applications in ultrafast all-optical switching devices owing to their enhanced third-order nonlinear susceptibility, especially near the surface-plasmon-resonance (SPR) frequency. 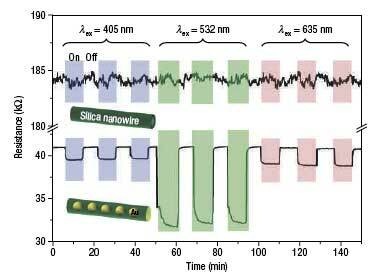 The hybrid nanowire used by the researchers in Taiwan shows pronounced SPR absorption. "More remarkably" says Chen "a strong wavelength-dependent and reversible photoresponse has been demonstrated in a two-terminal device using an ensemble of gold nanopeapodded silica nanowires under light illumination, whereas no photoresponse was observed for the plain silica nanowires." As the above illustration shows, the photoresponse behaviour at a SPR wavelength of 532 nm shows a larger difference in resistance between the illumination on and off conditions. The resistance change is nearly five times that observed using 635 and 405 nm light. These results show the potential of using gold nanopeapodded silica nanowires as wavelength-controlled optical nanoswitches. The microreactor approach can be applied to the preparation of a range of hybrid metal–dielectric one-dimensional nanostructures that can be used as functional building blocks for nanoscale waveguiding devices, sensors and optoelectronics.